The holiday season is here! While consumers are busy getting together shopping lists, it is a perfect time for businesses to get together their end of the year advertising plan. Holiday spending is expected to increase by 7% – 10% this year, and it is no secret that more shopping means an increase in traffic through out the Wiregrass. 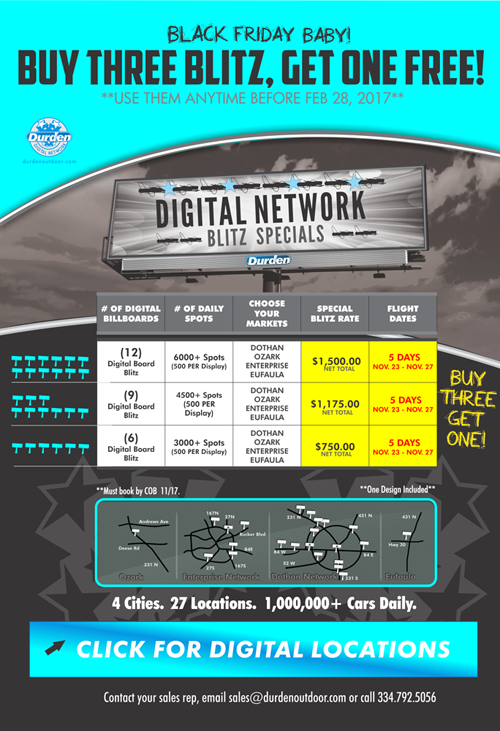 The Durden Digital Network is perfect for targeting shoppers with our 28 digital billboards located in Dothan, Enterprise, Ozark, Troy and Eufaula. Ad placement in high traffic areas, along with a memorable message developed by our Creative Team, makes for an extremely valuable advertising opportunity. Digital Blitzes are an effective way to concentrate advertising efforts on certain key dates. Durden Outdoor is currently offering some pretty great Black Friday Blitz Packages (see below). If your company would like to increase their bottom line during the holiday season, contact one of our creative image advisers today to take advantage of these specials. http://www.durdenoutdoor.com/wp-content/uploads/2016/06/DUR-Footer-Logo.png 0 0 Amy Riddle http://www.durdenoutdoor.com/wp-content/uploads/2016/06/DUR-Footer-Logo.png Amy Riddle2016-11-10 21:58:282016-11-10 21:58:2845 Days until Christmas!